Valentine’s Day is all about showing some love, and that includes our favourite athletes too. Bromances are everywhere, but there are a few that stand out a bit more than others. Every sport has them, and whether intentional or not, they’ve became a part of what fans love to see. Since Lowry came to the Raptors in 2012, the relationship between himself and DeMar DeRozan has become one of the most notable in the NBA. But things weren’t always this way for the pair. According to DeRozan, the two didn’t even talk their first season together in Toronto. At the time, Lowry was still a backup to Jose Calderon and with trade rumours swirling about Lowry being shipped off to the Knicks, but instead it was Lowry’s close friend Rudy Gay who was traded. It was this trade that brought the two together, and they’ve been almost inseparable since. With the Raptors sitting in first place in the Eastern Conference, the fans are hoping to see this duo together for years to come. Taking “bromance” to a whole new level, because they literally are brothers. The two have been on the same team for their entire hockey careers, and seem to have some sort of twin telepathy thing going on between them. While their careers are winding down, the Sedins aren’t quite ready to hang up their skates just yet. The pair were selected 2nd and 3rd overall in the 1999 NHL Draft by the Canucks and have been cornerstones on the franchise since. While they came close to it in 2011, the pair has never won a Stanley Cup. Despite not winning and now being in the final year of their contracts, they’re committed to Vancouver for the future. The history between these two began long before they were stars in the MLB. The pair of Las Vegas natives actually played against each other in Little League growing up and again in high school. 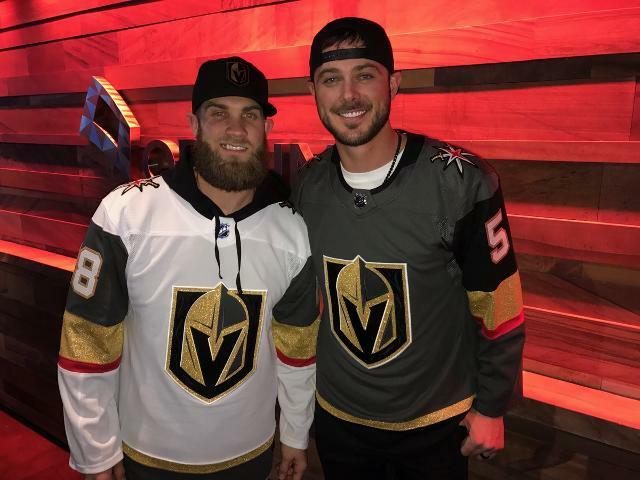 While they’re now in Washington and Chicago, they still find a way to stay connected to their hometown, including taking in a Vegas Golden Knights game together. Even though they were rivals growing up, there’s nothing but love between the two now. When Bryant was breaking into the league, Harper might’ve been his biggest supporter at the time. Could we see these two playing together in the future? Harper is a free agent after this season, and there’s no doubt that Bryant will be trying to recruit his longtime friend to sign with the Cubs. When Julian Edelman joined the Patriots he was primarily a special teams player. In fact, his Wikipedia page lists him as “receiver/return specialist”. Now, he’s become one of Brady’s favourite and most reliable receivers and was a key part of the Patriots two most recent Super Bowl wins. When the Patriots were trailing the Falcons at halftime, Edelman was the one that went to Brady telling him it wasn’t over yet, and made one of the best catches in Super Bowl history. Part of the reason for this bromance might be because of their hometowns. Both players were born in California and have spent time training together in the offseason. Edelman also brings out Brady’s sense of humour, which was on full display last summer. Edelman was selected for the cover of ESPN’s Body Issue, and Brady made sure to have some fun at the expense of his teammate.